Online applications are invited All over Pakistan for Meezan Bank Limited, Pakistan’s first and largest Islamic bank for Multiple jobs positions. Bachelor/Master degree from recognized University. Customer Handling & Problem Solving. Knowledge of basic Islamic Banking concepts. SOC & Basic Branch Banking Procedures. Bachelor’s in Computer Science/BS-IT from recognized University. 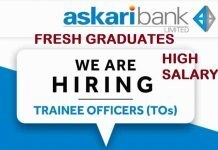 Minimum 2 years banking experience, preferably in Acquiring Business. Analytical & good Communication skills. Must have knowledge of Prudential Regulations. Team Management & Business Analysis. Excellent Communication & Report Writing. Good Communication & able to work under pressure.